Marshall's homage to the past is still a potent tool for today's players. Extremely faithful build. Organic, natural-sounding tone. Classic looks. Cheaper than a vintage option, but it will still set you back. 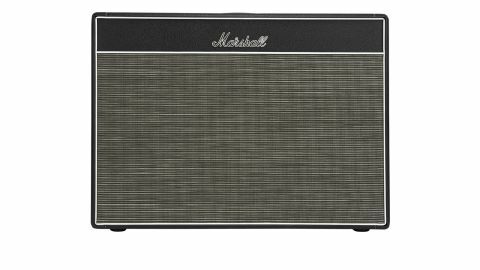 Arguably one of the top three most influential guitar amps of all time, Marshall's 1962 'Bluesbreaker' 2x12 combo occupies a special place in the electric guitar's history. Confusingly first sold in 1965, it was in March 1966 that a young Eric Clapton took one of these amps, together with a 1960 Les Paul Standard, to Decca Studios in West Hampstead and recorded his first album with John Mayall. Marshall has reissued hand-wired versions of the 1962 before in limited numbers, but this is the newest and more permanent addition to the flagship Handwired range, together with a reissue of the rare 2245 Super Tremolo head - the same amp without the loudspeakers. Externally, the 1962HW and 2245THW push all the right buttons, with impeccably finished cabinets covered in black vinyl with gold stringing, horizontal pinstripe grille cloth on the combo, and the small, gold-topped Marshall logo. Inside, the hand-wired turret board circuit is a real work of art, with wires bent at right angles, AC pairs twisted and pushed into chassis corners to reduce hum, and bundles tied together with neat black lacing. "The vast majority of the 1962's internals are as close as you can get to the originals"
It all looks exactly right, and while some components, such as the plug-in mains and impedance selectors, have had to be changed to comply with modern safety legislation, the vast majority of the 1962's internals are as close as you can get to the originals, right down to original-spec Drake transformers. The valves include a GZ34 rectifier and a pair of reissue KT66s in the output stage, which, along with the transformers, are crucial to the Bluesbreaker tone. For Marshall, the KT66 marked the transition from the more difficult to obtain 6L6 and 5881 types used in earlier models to the more cost-effective and plentiful EL34, still used to this day. The electronics are the same dual-channel design common to many Marshalls from this era. There are two permanently-on preamp channels, called 'Normal' and 'Bright'. Each channel has a pair of inputs and a volume control, feeding the standard shared Marshall tone network of bass, mid, treble and presence. Two extra knobs govern the tremolo effect's speed and intensity, with a single-button footswitch to toggle the tremolo on or off. Overall, both head and combo are finished and presented perfectly; guaranteeing any potential owner the full-on vintage Marshall experience, with bombproof build-quality. The vintage dual-channel design can be used in one of two ways: you can plug into either normal or bright channels, in which case only one volume control will be active, or you can use a small jumper lead to connect both pairs of channel inputs. Used like this, both channels are active. The Normal channel is quite dark, while the Bright channel is very bright - particularly if you use a guitar with single coils. However, in jumper mode, you can use both volume controls to mix and blend the two channels to taste to achieve an ideal balance. "Turned-up, the Bluesbreaker's response is organic - almost alive"
The magic starts to happen with the volume controls set around halfway - push it up more and the KT66s start to overdrive and fatten up the tone, interacting more with the speakers, while the rectifier valve adds a squashy dynamic feel that quickly becomes highly addictive. Almost any guitar is going to sound great, but if you want the classic Bluesbreakers tone, you need the punch and sustain of a good Les Paul. Our PAF-loaded Standard brought us as close as we've ever got to duplicating Clapton's groundbreaking tones on tracks such as All Your Love and Double Crossing Time. In various interviews, Clapton has remarked he simply turned his amp up all the way up to 10 and just went for it. Used like this, the Bluesbreaker's response is organic - almost alive. You turn down to clean the sound up for rhythm backing; turn up for soloing and all the grit and sustain returns. Aimed mostly at Marshall purists, who want the tone and legendary reliability of the early hand-wired amps, the new 1962HW and 2245THW deliver everything you'd expect them to and more. Obviously, they're expensive, but compared with an original, with all the maintenance and reliability issues that come with using 50-year-old equipment, both amps represent very good value for money. If you want to find out what all the excitement was about back in 1966, there's no better choice available today.